Venezuela appears to be sliding toward a more volatile stage of unrest after anti-government forces looted weapons during a weekend raid on a military base and frustration over what some see as an ineffectual opposition leadership boils over. Last week’s installation of an all-powerful new legislative body run by leftist President Nicolas Maduro’s Socialist Party loyalists, despite massive protests and a global outcry, has left many Venezuelans feeling there are no more democratic options to oppose the government. That sentiment may have helped trigger Sunday’s raid on a military base near the city of Valencia by soldiers and armed civilians, in which the government said two people were killed. Venezuelan authorities say they are hunting 10 of the attackers who escaped with a cache of weapons. In a pre-taped video, the group of more than a dozen men in military-style uniforms said they were seeking to restore constitutional order and called for Maduro to step aside in favor of a transitional government. The raid has raised the specter of a coup or a surge in already serious levels of violence in the country of 30 million as its slides further into an economic crisis and chaos. Even before Sunday’s attack, Maduro’s consolidation of power had left many protesters disappointed with what they see as a quarrelsome and self-interested opposition coalition. More than 120 people have been killed and thousands arrested in four months of unrest that failed to prevent last month’s elections to the new constituent assembly. Many hardliners felt betrayed as their leaders appeared to hesitate on strategy and postponed protests last week. The coalition’s many political parties have also diverged over whether to take part in gubernatorial elections in December, especially after widespread accusations of fraud in the constituent assembly election. For the hooded youths who block roads with iron metal sheets and debris – forming the militant fringe of an otherwise broadly peaceful protest movement – the fragmented opposition leadership is already history. The 20-year-old, whose face was covered with a T-shirt as he brandished a homemade petrol bomb, declined to give his name for fear of reprisal. A new public prosecutor, named by the constituent assembly in its first session on Saturday, has pledged to crack down hard on the demonstrators. 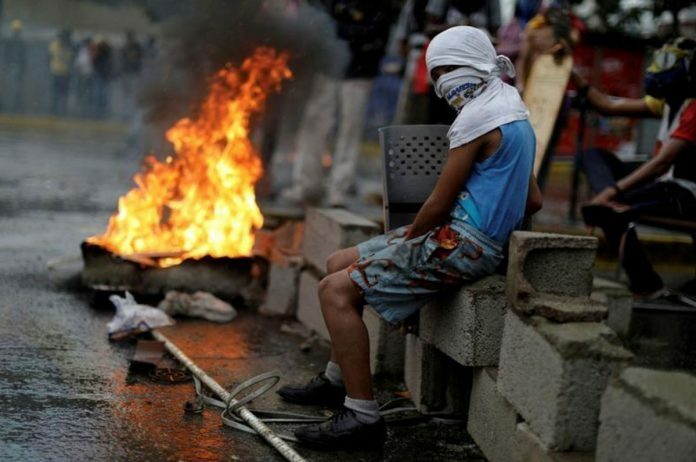 Government repression, however, threatens to push militants within the protest movement underground and into the formation of paramilitary or rebel groups in a country awash with weapons, according to political analyst and pollster Luis Vicente Leon. “As the government radicalizes, these groups will tend to grow and the future could be full of conflict,” Leon told Reuters. He did not elaborate, but other analysts have also spoken of the threat of a low-intensity civil war in Venezuela barring some reversal in the country’s current decline. In what could be a harbinger of more violent tactics by protesters, an improvised explosive device wounded seven police officers on motorbikes during the election of the constituent assembly on July 30. Maduro has said he is facing an “armed insurrection” designed to end socialism in Latin America and let a U.S.-backed business elite get its hands on the OPEC nation’s massive crude reserves. On the surface, at least, the prospect of a decisive military coup to oust the former union leader, who was narrowly elected in 2013 after being hand-picked by former President Hugo Chavez to succeed him, seems far off. There have been no outward signs of any split between Maduro and the military leadership, which continues to publicly back him. But the purported leader of Sunday’s raid on the military base, fugitive former National Guard captain Juan Carlos Caguaripano, has called on his “brothers in arms” to disobey orders from military leaders. And Oscar Perez, a rogue police pilot who attacked government buildings in a helicopter attack in Caracas in June, has said he is keeping up the fight while on the run. Many of her fellow opposition supporters, however, are exhausted after four months of street demonstrations and disruptions to daily life, which ultimately failed to make Maduro accept opposition demands. Turnout at marches called by the opposition has fizzled in the last few weeks, and some people just want to return to work quickly in the country plagued with empty food shelves, runaway inflation and a fourth straight year of recession. Opposition leaders have long been seen as out of touch with ordinary Venezuelans, and the country’s growing number of poor people, but they continue urging unity and hope for the future. Surge in Violence Haunt Venezuela. Last week’s installation of an all-powerful new legislative body, has left more Venezuelans opposing the government.